Brief Description: Asperger syndrome is a form of autism affecting an individual’s ability to understand, communicate and interact with other people. As it is often not obvious from their outward appearance that someone has Asperger syndrome, people do not always realise that they are different, leading to confusion on both sides. This new book by Olley Edwards, who has herself grown up with Asperger syndrome, aims to help Asperger girls gain a better understanding of their condition and take control of their lives to become more effective and happy individuals - without changing who they are. Why Aren’t Normal People Normal? 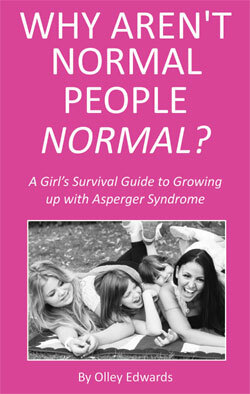 explains the difficulties that girls with Asperger syndrome may encounter and gives practical suggestions for coping with everyday situations. This is a much-needed, practical, self-help book written by someone who has first-hand experience of trying to co-exist with ‘normal’ people. This book is for anyone with Asperger syndrome and all the many as yet undiagnosed girls who are feeling socially isolated and misunderstood without understanding why. About the Author: Olley Edwards is an actress and writer, with a keen interest in female Asperger syndrome, who dedicates much of her time to researching and raising awareness of the condition. Olley is a single mum to three daughters; one neurotypical, one with Asperger syndrome and one with autism. In the course of raising her children, Olley discovered that she, too, had Asperger syndrome and the OCD, anxiety, eating problems, naivety, frustration and isolation she had experienced throughout her life were at last explained. Having studied autism and psychology, Olley now works to promote awareness of female Asperger syndrome by giving interviews, making films and writing about the symptoms and traits of those with the condition. Olley is a frequent guest speaker at high profile Autism events with the National Autistic Society and is a voluntary teacher at schools and clubs for autistic children. She also writes under the name Carly Jones. Why Aren't Normal People Normal? is a super book from the author Olley Edwards. She has been affected on a personal level by Asperger Syndrome and is now a person who clearly has an expert opinion to present to people about this condition. A fascinating read and well recommended.